The English victory over the French at the Battle of Agincourt has been immortalized by none other than William Shakespeare and is often hailed as one of the greatest military victories of all time. The battle that occurred in a muddy farmer’s field during a series of encounters called the Hundred Years War assured young King Henry V’s place in history as one of England’s greatest kings. Two months earlier, Henry had arrived in France and attacked Harfleur in Normandy. The town surrendered in just over a month, but Henry had lost half his troops to battle wounds or disease. He decided to cut his losses and return to Calais, where he would meet his fleet and go back home to England. There was one slight problem though. 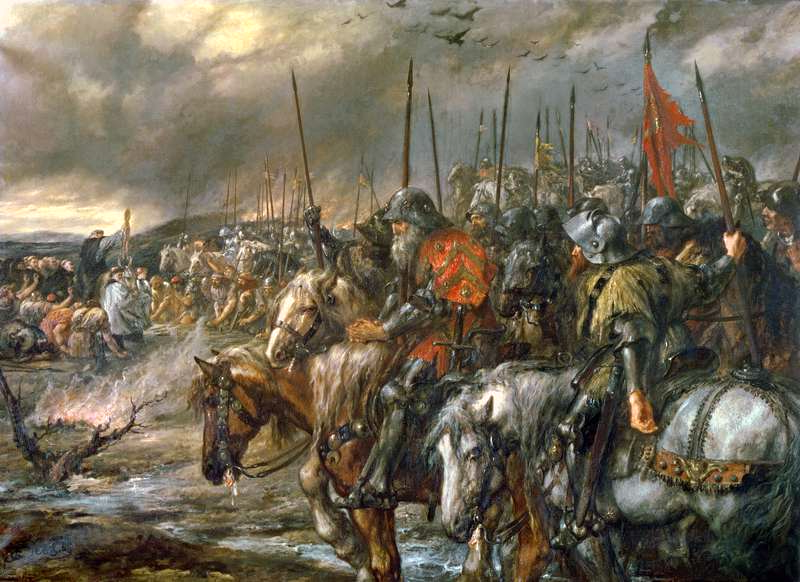 When Henry and his men reached Agincourt, 20,000 Frenchmen stood in their way; the English were tired and vastly outnumbered, so weren’t looking for a fight. Seeing as they had no choice though, the English stood their ground as the heavily armored French army slowly made their advance. The English countered with a merciless bombardment of artillery from longbows with an impressive range of 250 yards. The French cavalrymen were unable to overcome the English positions, and pointed stakes protected the archers. As more French troops flooded the battlefield, their mobility was drastically hampered by their own heavy armor and the muddy terrain. Henry’s archers and soldiers then had no problem massacring the French, many of who were literally stuck in the mud. Some sources number French losses at 6,000 that day, with English casualties drastically lower at 400, despite being vastly outnumbered. From this, Henry is credited with one of the greatest military victories of all time. Or was it? Agincourt’s reputation as one of the greatest against-all-odds military wins in history is being re-evaluated by historians from England and France after examining contemporary tax and military records. The historian’s findings led them to believe that the English could not have been outnumbered more than two to one. These new revelations are in direct opposition to a much cherished ideal that even fact- loving researchers and historians are hesitant to challenge or tarnish. “It’s just a myth, but it’s a myth that’s part of the British psyche,” said Anne Curry, a professor at the University of Southampton, who is leading the study. Though there are still those that claim the English were outnumbered to the tune of four to one, many French historians point out that France was crippled by the plague and riddled with factional strife at the time. Their king, Charles VI, was teetering on the brink of insanity, and it’s highly unlikely an army of that size could have been mustered that quickly under such adverse circumstances. Some modern experts estimate the number of French at Agincourt to have been between 12,000 and 15,000, while King Henry’s troops probably came in around 8,600. Still an impressive victory, but not really one of the greatest of all time. What is not in dispute is the gruesome scene when the heavily armored French fell in the mud and either drowned, or were stabbed through gaps in their armor in the eyes, neck, groin or armpits by English archers. There is absolutely no doubt that King Henry emerged victorious, and, as kings and other leaders through time have been prone to do, he may have tweaked the numbers a bit to make his achievement look even more impressive. Some things never change.